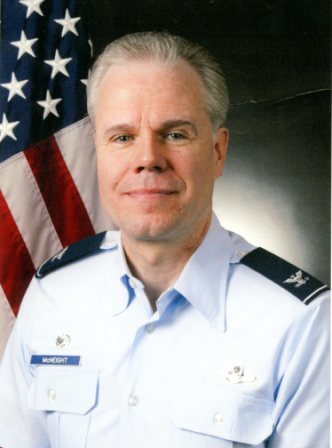 Colonel McNeight’s obituary has not been posted online yet but we understand that Carmichael Funeral Home of Smyrna, Georgia has been entrusted with arrangements http://www.carmichaelfuneralhomes.com/ Phone: (770) 435-4467. All available information appears below and as more news is received we will be sure to pass it along. One more note: The family is asking folks to wear their service dress if possible. 2950 King Street , Smyrna GA 30080....(770) 435-4467 Sunday 5-8pm. He grew up in the small town of Stratford, Wisconsin and is the son of the late Allison and Adella McNeight. He earned the designation of Eagle Scout as a young man and the honor of appointments to both the Air Force and Naval Academies. He knew that he wanted to be a pilot since he was eight years old and has been blessed to be able to live his dream. Thank you to retired LTC Mike Manning for forwarding the sad message below of the death of former 700 AS Commander, and retired Delta Captain, Colonel Kevin J. McNeight, 59. He was born 8/20/1958 and was hired by Delta 10/14/1988. You may view or sign the online Guest Book at http://www.legacy.com/funeral-homes/georgia/smyrna/carmichael-funeral-homes---smyrna/fh-3466 I will send an obituary when it is printed. I am saddened to inform you that Col Kevin McNeight passed away yesterday, 10 March 2018, at 0100. He had been fighting a health issue for years. The funeral arrangements are on Monday, 19 March 2018, at 1000, at the Cathedral of Christ the King in Atlanta, GA.